Stress is an epidemic afflicting almost everyone from young students to the elderly. Psychosomatic disease is either caused or aggravated by mental or emotional stress and manifests itself in the body; it can range from problems that impair functioning, such as stomach disorders and back pain, to risk factors leading to mortality, such as high blood pressure. During the Transcendental Meditation practice the body settles into a state of deep rest, allowing for accumulated knots of emotional and physical stress to be eliminated—published studies show that the body naturally restores balance. Research has shown that TM practice normalizes hormone levels, blood pressure and creates measurable improvement in diabetes, cholesterol, cardiovascular health and brain functioning. The body is cultured to maintain a more rested, calm and simultaneously energetic style of functioning during the day and evening after meditation, making us more resilient to stress. 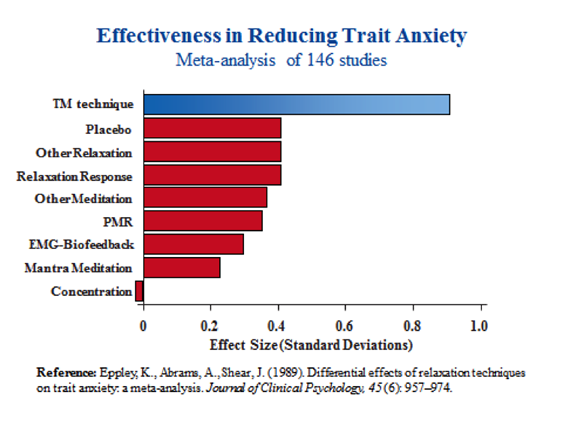 Among many studies showing reduction in stress and anxiety from TM practice, one significant meta-analysis showed that the Transcendental Meditation program uniquely reduces trait anxiety—anxiety that has become a feature of daily life. 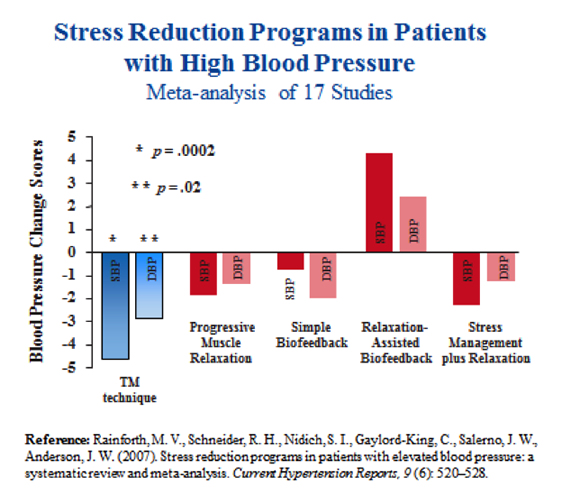 A research study published in 2007 found that the Transcendental Meditation technique compared very favorably to other programs aiming to reduce stress in patients with high blood pressure. Stress also reduces quality of life when suffering from disease that is not psychosomatic in origin. The reduction of stress from TM practice allows a patient to appreciate other aspects of life while dealing with the disease in a more clear-minded way. Published in the peer-reviewed journal Integrative Cancer Therapies, one study found that women with breast cancer who practiced the TM technique experienced reduced stress and improved mental health and emotional well-being through the course of their illness. To eliminate the toxic effect of stress and to guard against the accumulation of more stress, let’s consider the ancient health system of Ayurveda. Ayurveda comes from the same tradition as the Transcendental Meditation program and Yoga. Ayurveda is recognized by the World health Organization as the oldest continuously practiced system of medicine in the world. It is based on natural approaches to health that have no harmful side effects, it promotes consciousness-based technologies such as meditation, and it is prevention oriented. Maharishi Ayurveda is Ayurveda that, in the early 1980s, Maharishi restored to the original purity of its content so that it would have complete effectiveness in accord with natural law. This restoration and revival were necessitated by the fact that the purity of Ayurveda had been compromised over many centuries, partly due to foreign invasion of India. The modalities of Maharishi Ayurveda enliven the body’s own self-healing mechanisms, naturally restoring balance and good health. Maharishi Ayurveda helps us live life in accord with natural law, first and foremost by opening our awareness to the home of all the laws of nature in the silent field of our own pure consciousness through the TM practice, and secondly by using the MAV instructions to align our daily routine, dietary habits, and so on with the rhythms and principles of nature’s intelligence. Go to bed and turn lights off by 9:45 PM and get up by 6 AM. Walk for at least ten minutes (ideally 20-30 minutes) outdoors in the fresh air within two hours after sunrise. Eat your largest meal of the day in the middle of the day—around noon. By 7 PM, eat a light evening meal excluding meat, rich sauces, and cheese. Drink plenty of pure spring water during the day, either warm or at room temperature.